These courgettes are gorgeous served freshly cooked or as a chilled salad. White balsamic vinegar adds a full, sweet flavour but you can substitute white wine vinegar, if you like. Preheat a griddle pan until hot. Mix the sage with 4 tablespoons oil and season. Brush the undersides of the courgettes with a little sage oil, then lay the courgettes in the pan. Cook in 3-4 batches for about 3 minutes on each side until browned, brushing with oil before turning them. Arrange on a serving plate. Mix together the remaining oil and the vinegar. Season and pour over the courgettes. Cool and chill, or serve warm. 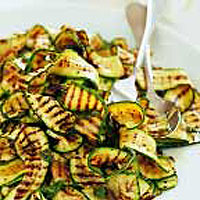 Alternatively, cook the courgettes on a foil-lined grill rack under a hot grill, turning once.